Veep Joe Biden handing out today's diplomas. 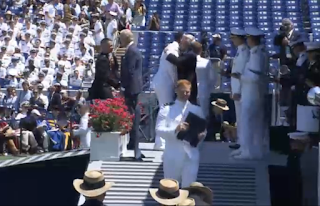 Today, the US Naval Academy class of 2015 graduated. When I graduated, in 1993, I was ready to take on the world. My challenge, as a new second lieutenant, was that I had a lot to learn after graduation, not from books but rather from experiences. Here are a few things I wish I had learned sooner, rather than later. No, don't ask your seniors why, ask your subordinates. Before losing your temper with subordinates, when things aren't going right, ask, "Why?" This is Stephen Covey's fifth habit. When I was a supply officer, we had some equipment that needed to be moved from one area of our warehouse lot to another. The warehouse chief told me that he'd take care of it while I was at a meeting. When I came back I was surprised to see that this task hadn't even been started. I was a tad unhappy when I asked, "Why wasn't the equipment moved?" I was immediately thankful that I worded the question the way I did, rather than using a "What the hell is going on?" tone. The warehouse chief's answer to my question was something I hadn't considered, "Sir, the CO came by while you were at your meeting and told us not to move the equipment." Every good Marine knows to follow their last order first after pointing out the conflict. When I was a new second lieutenant I frequently answered a superior's simple yes or no question with an explanation before giving the answer. After I was cut off, a couple times, and told, "Just answer the question...yes or no?" I got the hint. Start with the simplest answer you can give and go from there. After awhile, you'll get a feel for how much of an explanation is needed. The Naval Academy is the leadership crucible. There are plenty of examples of how to lead, and how not to lead. Leading is a challenge, and outranking your subordinates makes it easier. At Annapolis, we're all the same rank. Leading peers is hard. You can fool your seniors and you can fool your subordinates. But, fooling your peers is nearly impossible since they see you when your guard is down. The best leadership experience I had my Firstie (senior) year was being a company commander. That gave me the confidence to speak to 120 midshipmen, while standing in front of the company, everyday. I constantly reviewed my technique, delivery, message, and mistakes so I could improve. After graduation, I was a little slow to learn a key aspect of my job in addition to leadership: managing up, known in the military as staff work. A staff is a group of peers. Each has administrative, technical, or tactical expertise in their area of responsibility. A battalion staff is typically managed by the executive officer, who is the chief of staff. The entire staff reports to the commanding officer. Unlike one-on-one meetings or working sessions, staff meetings are primarily used for reporting status updates and quick, simple decisions. I was slow to learn that I was expected to make recommendations to my commanding officer (CO). An example of good staff work is when you need a decision from your CO. Let's say that there are two possible choices, option A and option B, that require the CO to sign off on a memo or letter announcing their intent. When you show up for your one-on-one meeting with the CO, you may not know which choice the CO will make. So, you should draft up two separate memos for signature. One memo supports option A and the other supports option B. After you present your recommendation the CO will make a decision and sign the appropriate memo. This example is how the process works in it's simplest form. It enables you to see other's perspectives. More importantly, it is a more efficient use of time since a second meeting isn't needed to sign the paperwork. This is a leadership technique that's more of an art than a science. Basically, if you can get into the mindset of assigning tasks to the most interested party, you'll get the best results. This works well in most organizations whether in the military, a corporation or a family. Timing is also an issue when delegating tasks or passing information. Don't task someone when passing them in the hallway or as as they're headed out the door for PT because they're likely to forget it. Try to control your excitement of needing to pass along information. What good is it to task someone when they're not in a good position to receive and act on that information? The reason people pass information at inopportune times is because they are worried about forgetting it, themselves. It's not about passing the buck and checking a box where, later, you can say, "I told them to do it." Rather, it's about having the task accomplished by setting people up for success. Here are my tips for Time Management in the 21st Century. Marines know that they have to carry their weight, regardless if they're sick, lame, or lazy. This drives Marines to push themselves so they're not a liability. There's sometimes a perception that one should not go to sick call, when appropriate, and have an entry made in their medical record. At some point in the future you will no longer be on active duty. The VA will evaluate your health, based on your medical record, so anything that's missing will work against you. Something minor, from decades ago, could turn into something major, tomorrow, so having a record of it is important. Occasionally, you have to let a subordinate fail, resulting in you or your team taking a face shot. This isn't a case of hanging someone out to dry, rather, it's that you can't step in and do someone else's job when they're failing. I've written about this in detail in Let Him Fail. When this does happen, consider the possibility that a subordinate's shortcoming may be a result of your failure to properly train them. While that may not be the case, simply think about how the problem could be avoided in the future. Q: How do you know if someone went to Harvard? Yes, the service academies are vastly different experiences compared to civilian colleges and universities. (And, yes, I told you in the second sentence of this blog post that I graduated from Annapolis.) But, officers from the Naval Academy aren't better people than officers from other commissioning sources. The Naval Academy may make an individual a better officer, initially, since they've spent four years on active duty by the time they're commissioned. But officers from civilian schools have faced an array of issues that midshipmen were shielded from such as college loans, rental leases, working a job, daily commutes, doing their own laundry, taking out the trash, and raising a family while studying. Honesty, integrity, and setting the example are key. People, in the military and in the civilian world, will follow your example as I pointed out in Everyone's a Leader. And, while lying is discouraged, there are times when it's okay to be deceptive which I covered in Ethics for the Junior Officer. 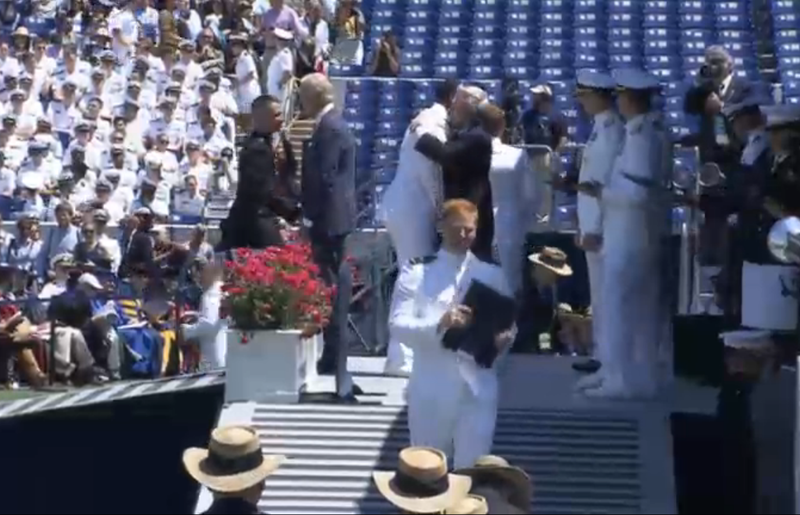 Congratulations and fair winds and following seas to the US Naval Academy Class of 2015.